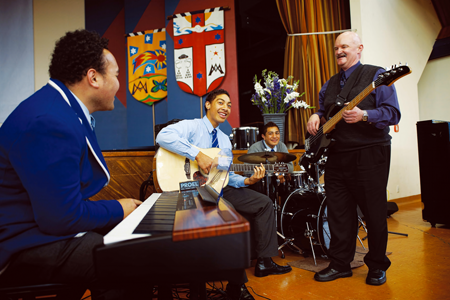 Brother Matt Morris plays bass guitar with the St Patrick’s College band. Many Marists are priests, but not all are. Brothers are lay people who live the Marist life alongside the fathers. Like priests they belong to the Society of Mary, living the same spirit and community life. Brothers work in the same sorts of ministry as the priests, though they don’t celebrate Mass or the sacraments. In practice, a brother has greater scope and diversity of work options. He may have a trade or a profession. As lay men, brothers are more like the people ‘in the pews’. And generally, brothers are closer to them. In the seminary, all students do the same courses – whether they wish to be priests or brothers. Both vocations require a good education in the faith. Therefore, if a student wishes to delay this choice of being a priest or brother, he may do so for several years while continuing his training. The brothers who train at the Marist Seminary (for the Society of Mary) are brothers who live and work with the fathers. For clarification, there is another branch of Marist Brothers who run their own projects – and have their own training program. These brothers are much more numerous. They are well known for their youth work and their excellent schools which are found all over the world.